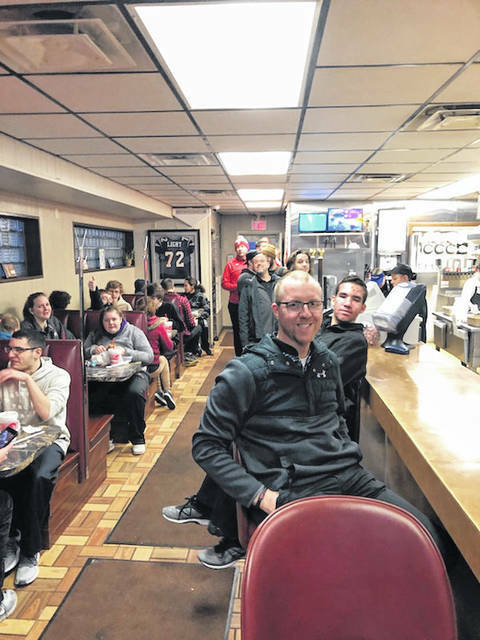 The Butler bowling teams celebrated a sweep over Greenville on Tuesday with a visit to the famous Maid-Rite Sandwich Shoppe. GREENVILLE — The Butler boys and girls bowling teams traveled to Greenville on Tuesday and came away with a sweep of the Green Wave. The boys team improved to 11-1 overall and 10-1 in GWOC North play with a 2,495 – 2,319 over Greenville to remain a game ahead of second place Troy in the loss column. The Lady Aviators remained in second place by improving to 7-5 overall and 7-4 in league play with a 1,917 – 1,802 win. Drew Sacks (210-246) led the way for the Butler boys with a 456. Will Yeary (255-199) was just behind at 454 while Aaron Seelbaugh (196-222) rolled a 418, Ben French (189-205) rolled a 394 and then Ian Jacobs bowled a 193 and Jake Smith a 173 to share the fifth spot. The Aviators (216-191) combined for a 407 in the Baker games. The Lady Aviators were led by Alissa Spieled (181-245) with a 426, Breanne Kroeker (200-175) with a 375, Emily Gabert (146-152) with a 298, Katrina Herzog (158-119) with a 277, and Emma Sutter (102-142) with a 244. The Lady Aviators (138-149) combined for a 297 in the Baker games. The Aviators were scheduled to travel to Toledo on Saturday for the Muskingum University High School Tournament. They will return home next week for three matches at Poelking Marian Lanes in Huber Heights. Troy will come calling on Monday for a league contest, Newton will visit on Wednesday, and Sidney will visit Thursday for another league match. All of those matches begin at 4 p.m.